This year marks the 150th anniversary of The Salvation Army organization worldwide and also commemorates 130 years serving in the Chicagoland area. As one of the oldest nonprofit organizations in the city, The Salvation Army Metropolitan Division is also one of the largest direct providers of social services locally. 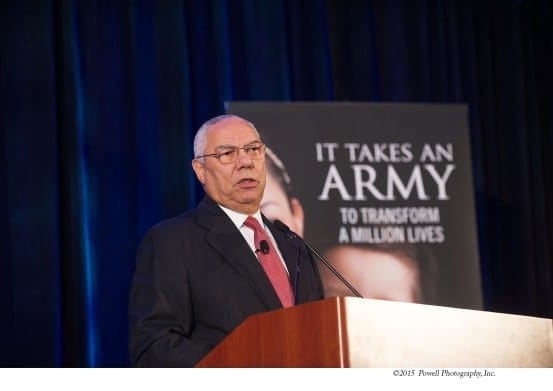 To help celebrate the organizations anniversary was American statesman, philanthropist and military leader, General Colin Powell, USA (Ret.) delivered the keynote address at an event celebrating The Salvation Army’s 150th worldwide anniversary at the Sheraton Chicago Hotel and Towers June 15. His delivery was riveting, exciting in the least and most informative and insightful. He moved the audience to tears, laughter, somber repose, inspired and touched them. Also at the luncheon, Patricia Hemingway Hall, President and Chief Executive Officer of Health Care Service Corporation, will received the Salvation Army 2015 William Booth Award, the highest award that may be conferred upon an individual by The Salvation Army, and named after the organization’s founder. Past recipients of this award have included Bill Clinton, Senator Paul Simon, and Ambassador John Price, just to name a few. The Salvation Army honored Jewel-Osco with the 2015 “Others” Award for their long-term support as a corporate partner.